How does Mesh's product fit into Intel's Viiv digital home? Intel's Viiv technology has been so overhyped that it's easy to forget there are machines around to actually look at. This system arrived at the PC Answers office without its all-important Viiv sticker. So is it a Viiv system at all? It's based on the AOpen EPC945 barebones. This half-height chassis houses a board complete with the Viivcompliant Intel 945G chipset and its integrated graphics. The chip is a 3.2GHz Pentium D 940. With Core 2 Duo on the horizon, don't expect the Pentium D to hang around for long, especially in applications such as Media Centers where heat and noise are prime factors. The system also features 1GB of DDR2 RAM as well as 300GB of hard drive space. The latter is no longer a huge amount of storage, but still more than you'll probably need for some time to come. One of the things that we like most about this system is that it's quiet. However, it's warm to the touch; hardly the end of the world, but certainly something to bear in mind. The ViVa does have one welcome feature: it can connect to your TV via SCART. It's not the fi nest connectivity technology known to man, but it's prolific in its adaptation on European shores. As well as these and other standard rear ports, the system features a plethora of connections behind a flap at the bottom of the front panel. Another flap next to the DVD drive reveals a card reader. There are dual Black Gold Freeview tuners in the box. The cards are half-height to fit the chassis. Space inside is well used. However, we did have one fundamental problem testing this Mesh: there's hardly any Freeview signal in Bath, where PCA is based. Quite how this situation is resolved by the time digital switchover happens in 2010 is anyone's guess. One complaint that we do have with the unit is its peripherals of choice. 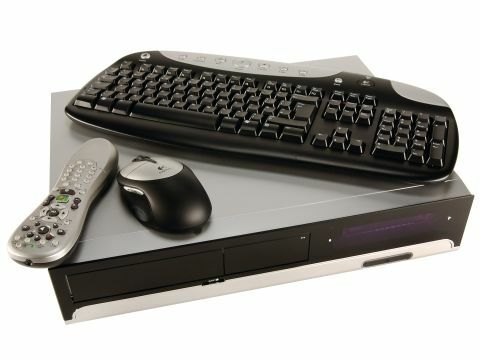 The keyboard is a reasonable quality wireless offering from Logitech, but we'd prefer to see a Media Centerorientated effort, Microsoft's Remote Keyboard for Windows XP Media Center Edition (phew) being the most obvious example. Also included is a non-Microsoft remote. It's fi ne, but it's indicative of how this good system is occasionally restricted by detail. Overall, though, spec is impressive, as is the price. £750 really isn't a lot for a system like this and if you're dying to get a Media Center right now, the Mesh is a good choice. However, we wouldn't blame you if you wanted something a little smaller - the look of the ViVa has rather split our number in two. Some rather like it; we think it could be better.